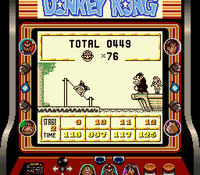 The Ship is the third world of Donkey Kong for the Game Boy. Donkey Kong escapes after his defeat in the Forest and seeks for peace with his kidnapped lady on board the Ship. This world features several water-themed levels, and spins on ropes and High Jumps from a handstand are required to complete certain levels in the world. Mario has to use Ussun to overcome pits of spikes. The Ship has 8 stages. The music that plays in this world is a remix of the Bonus Game music. ↑ Game Boy Donkey Kong Japanese instruction booklet, page 15. ↑ Game Boy Donkey Kong Dutch Nintendo 3DS Virtual Console digital manual, tab 14: "Gebieden". This page was last edited on April 13, 2019, at 10:20.